If there is one super important lesson to be learned from this year’s round of election polling, it is that online surveys work. Google Consumer Surveys, which use non-probability online samples, predicted the election far better than Gallup did. 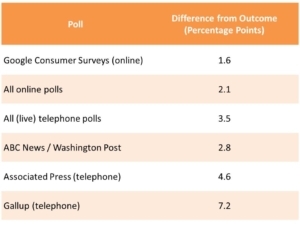 And online surveys, overall, outperformed telephone surveys. The New York Times’ Nate Silver compiled polling results from 23 organizations that conducted at least five surveys in the final three weeks of the campaign. He calculated how far their projections were from the actual outcome of the presidential race. Google (a fully automated, online solution) came in second place, predicting the actual outcome within 1.6 percentage points. Gallup (using “gold standard” telephone methods) came in last, predicting the outcome within 7.2 percentage points. Two of the most vociferous opponents of online polling, ABC News and the Associated Press did not do well either. ABC ranked 18th, predicting the outcome within 2.8 percentage points. The Associated Press conducted just one poll and so was not among the 23 ranked organizations, but their poll was 4.6 percentage points off from the actual outcome. How did online surveys fare, overall, compared to telephone surveys? The results are stunning. Internet polls predicted the election within 2.1 percentage points and telephone surveys did so within 3.5 percentage points. “Gold standard” telephone surveys are not looking so golden these days. The polling landscape has changed dramatically. When online surveys are feasible (sometimes they are not), perhaps the only reason left to conduct a telephone survey is to satisfy a methodological curmudgeon at one of a handful of news organizations still trying to stave off the Internet.